My favorite time of year is upon us; late summer, early fall. The warm days and cool nights with sound of crickets coming from the open windows, the cheer of the football fans from the television set and the smell of Buffalo Chicken Dip coming from the kitchen! My friend and co-worker Kristin introduced me this recipe of spicy, creamy deliciousness! It can be found on the website www.franksredhot.com and as usual I needed to change it to make it to our liking. There is one thing about their recipe that just didn’t sit well with me…canned chicken. Who knew?! I had no idea that chicken came in can just like tuna but I could not do it, instead I cook thinly sliced chicken breasts and dice them up, that way I know exactly what I’m eating. 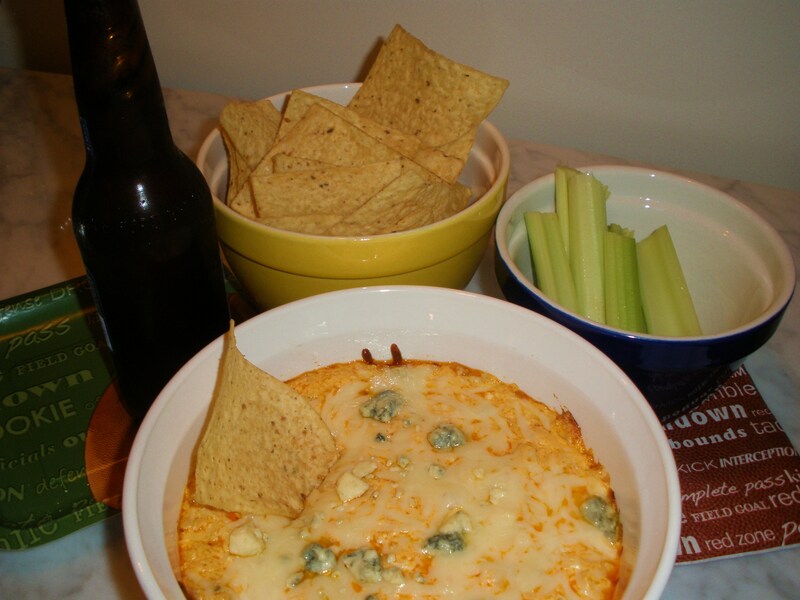 Spicy, Creamy, Hot, Delicious Buffalo Chicken Dip! Preheat oven to 350 degrees. Place chicken breasts in shallow baking pan, make sure they are not overlapping. Rub them lightly with vegetable oil and cook for 15 to 20 minutes-make sure not to overcook as they will be dry and tough. When they cool off enough to handle, cut up into very small pieces. Place the cream cheese in a deep baking dish, stir until smooth. Mix in the salad dressing (I use blue cheese), hot sauce and cheese (I use mostly mozzarella and a bit of blue cheese) and stir well then stir in the chicken. Sprinkle some of the mozzarella and a bit of blue on the top. Bake for 20 minutes until bubbly and heated through. I like to serve it with tortilla chips, corn chips, celery sticks and an ice-cold beer. But you can really do whatever you like…just make sure you are wearing your favorite teams jersey…Go Giants!! !